The DeltaWASP 2040 is a 3D printer that is designed to produce results to a professional level from the desktop in a school or workplace. Its operational capacity makes it suitable for those who already have some experience of using a 3D printer. The machine is capable of printing to a maximum of 300 mm/s with a number of different filament types. This 3D printer from DeltaWASP offers an ideal way to achieve precise prints, though it has a high price tag for a machine that has already been superseded. 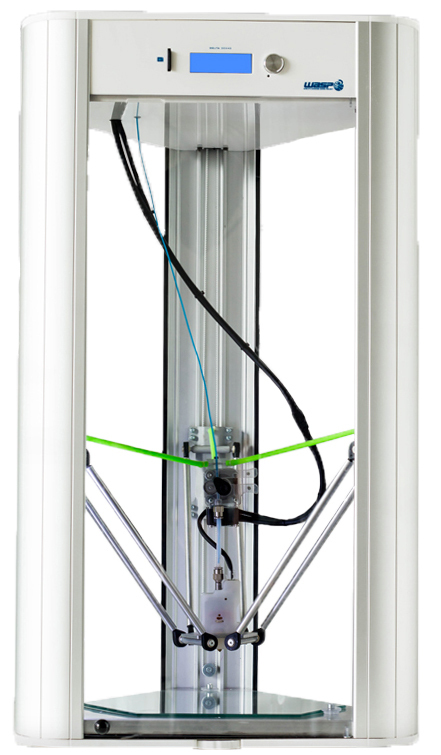 At 49 x 44 x 87cm, the DeltaWASP 2040 3D printer is a large machine that is capable of printing items to a maximum cylindrical size of 200-400mm. The 3D printer has a heated steel bed that reaches a maximum temperature of 100 degrees Celsius. The unit is in an enclosed style, which ensures that users will be safe when it is in operation. It is easy to control and includes a clear LCD screen. The DeltaWASP 2040 3D printer is compatible with several operating systems, namely Windows, Mac and Linux. The operation of this device is sophisticated enough for advanced users, and even has the capacity to continue where it left off when the power is restored after being suddenly interrupted. An SD card slot can be found within the aluminium casing to read memory cards. The DeltaWASP 2040 is larger than many other 3D printers on the market, which may take some getting used to for those who have experience of using other 3D printers. There is a turbo version of this printer available on the market, which can make this one seem obsolete.